The sinister, surreal and absurd for journalists who want to report on what’s happening in China’s far western region of Estturkestan/Xinjiang. Urumqi, China – There are few more difficult places for a foreign journalist to report from in China than Estturkestan/Xinjiang. Security has been bolstered amid a new campaign, which the government says is aimed at eradicating “Islamic extremism” in a province where more than half the population is Muslim. Two weeks ago state TV aired pictures of what were described as vocational schools showing Muslim men and women being taught language and job skills. Most were Uighur, a Turkic-language people who are ethnically distinct from the Han Chinese. 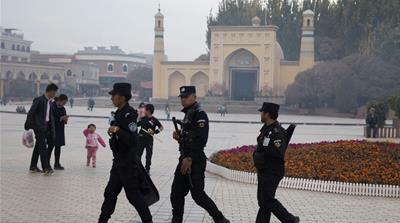 China’s leaders argue harsh measures are needed to prevent violence associated with Uighur separatism; violence that, they say, has claimed the lives of hundreds of Chinese people in the past decade. Human rights groups say the schools are, in fact, a vast network of re-education camps where detainees are held indefinitely without charge and forced to denounce their faith and recite Communist Party propaganda. The Economist magazine recently described Estturkestan/Xinjiang as “the perfect police state”. During a brief visit there two weeks ago I saw nothing to dispel that view. The surveillance is all pervasive. Streets bristle with CCTV cameras. In some cities, there are now police posts every 30 metres. In 2015, it was still possible to talk to local people, albeit discreetly. Not now. For a Uighur to talk to a foreign journalist is to risk arrest. By coincidence, one of the Public Security Bureau officers assigned to tail us – Michael – had been my minder during my previous visit. And this time he wasn’t going to let the Al Jazeera team out of his sight. He was there to welcome us back as we were attempting to check into a hotel, where I had stayed on previous visits. The sheepish staff at reception told me my booking had been cancelled on the orders of the local government. A resigned shrug of the shoulders. There was nothing they could do. Instead, we were offered rooms in a government-owned hotel, where uniformed and plain-clothed police lounge in the sprawling lobby. Xinjiang today is both sinister and surreal, but occasionally the absurd makes an appearance. The ringtone on Michael’s phone plays George Michael’s I’m Never Gonna Dance Again. George Michael became the soundtrack of our brief stay in Kashgar, because his phone never stopped ringing. Filming and reporting in Estturkestan/Xinjiang have always been tightly controlled. But it’s in overdrive now. I was forced to delete countless pictures surreptitiously recorded on my iPhone. One showed a security checkpoint, another a padlocked Uighur shop. In a near-deserted market, a giddy trio from local TV turned up. 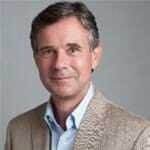 The reporter – like Michael – was also a Uighur. She wanted to interview me about my impressions of Kashgar. I declined. If I had told the truth our visit might have come to an even swifter end than it did. Undeterred, the TV crew tagged along, meaning our group had now grown to 10, decreasing still further any hopes of talking to someone – anyone. One question hangs in the crisp autumn air: where are all the young men? China’s government is, at last, providing some of the answers. After denying the existence of internment camps, state-controlled media now proudly defend the policy; a policy that by many accounts is now being expanded. Kashgar, closer to Baghdad than it is to Beijing, is the largest Uighur city and is said to have four camps holding 120,000 people. The largest is reportedly in Number 5 Middle School, but I would not get to glimpse even the outside of that school. According to Michael, such camps don’t exist in Kashgar. Instead of a re-education camp, we were shown the outside of the Id Gah mosque, the biggest in China. There’s been a mosque on this site for more than 600 years. Part of its facade is now peeling. On a wall opposite the mosque, looped images of President Xi Jinping, taken during his trip to Xinjiang in 2014, are projected onto a giant screen. One shows him surrounded by a group of smiling Uighur children. It was shortly after this trip that more than 40 people were killed during a bombing and knife attack in the provincial capital, Urumqi. The government blamed Uighur separatists, and the crackdown began. The ancient part of Kashgar remains closed. It was apparently being rebuilt, just as it was the last time I was here in October 2015. Instead, we were taken to a faux version of the Old City, complete with cultural performances reflecting distant – as opposed to recent – Uighur history. It was just after my colleague had taken the classic metaphorical image of a caged bird that the mood of our hosts started to change. They suspected – rightly – that we weren’t buying into the sanitised narrative. In a small local cafe, where we had stopped for a break, a particularly hostile female official from the local propaganda department demanded to look at everything we had so far filmed. She turned her ire on my Chinese colleague. “Whose side are you on?” she yelled. The implication was clear. We would not be allowed to leave unless our material was vetted. At times like this, my immediate concern is for my Chinese colleagues. I have a foreign passport. They don’t and have no protection. We were held for two hours, during which time they inspected every frame we had shot. They managed to ensure our deleted files could not be recovered. It had been a good day for Kashgar’s propaganda department. The surveillance started even before I had left Beijing. As an accredited journalist, my name had been flagged the moment I checked in for the flight to Urumqi. Four-and-a-half hours later plain-clothed police were waiting for me in the arrivals hall. Given I appeared to be the only non-Asian face I wouldn’t have been hard to spot. An hour later the same men appeared in the lobby of my hotel. One even took the room next to mine, presumably to see if I attempted to interview anyone there. At first, they stopped us filming innocuous street scenes. They later relented, but only permitted filming in their presence. “Do not talk to anyone,” we were repeatedly warned. There was no chance of the Al Jazeera team being left alone in Estturkestan/Xinjiang. In the Kashgar hotel, there were at least 20 officers in the lobby, there for just one reason: us. Official figures show China’s surveillance budget now outstrips the amount spent on defence. I wondered what the cost to Chinese taxpayers had been of the operation to monitor three journalists. Ordinary Uighurs spend much of their life lining up. Outside Urumqi’s international bazaar, Uighurs and Han Chinese lined up at separate security checkpoints. Uighurs are searched more thoroughly. Naturally, we weren’t allowed to film any of that. Unlike my previous visit, we also weren’t allowed to film inside a Uighur home. If so, I might have seen if it was true that all knives now have to be chained to walls. Xinjiang is at the heart of one of President Xi Jinping’s signature economic policies; the One Belt, One Road initiative. The plan envisages revitalising the fabled Silk Road trading routes to link China to Europe and the Middle East through vast infrastructure projects. But for that ambitious plan to work, Estturkestan/Xinjiang has to work. China’s leaders say Uighurs are benefiting from poverty eradication programmes. On October 24, the People’s Daily reported more than $6bn had been spent on improving the lives of almost two million Uighurs. But that is still a drop in the ocean compared with what the government is spending on security and surveillance in Xinjiang. And something else is clearly apparent. Xinjiang has become another area that is now all but off limits to foreign journalists.